I don’t think you have to be psychic to predict that June 2017 will be classed as Wonder Woman month! The film has taken the big screen by storm, landing it some very favourable reviews. It has been years in the making – not this particular film, but the rumours of a Wonder Woman film have been rife for years. I remember going years back when Jennifer Anniston was even mooted as a possible candidate to star in the famous star-spangled pants. As the saying goes, all good things come to those who wait… and boy, have we been waiting an age for Diana, Princess of the Amazons to turn up. Gal Gadot has made the role her own, giving a much needed boost to what promised to be an amazing movie, but was unfortunately flagging in an archaic plot that was ‘Batman vs Superman’. Although she only turned up towards the end of the movie, for many people who had waded through this disjointed plot, felt that upon Gadot’s entrance, we were watching the best part of the film! Now, we have her portrayal of Wonder Woman for a whole two hours! With this resurgence Wonder Woman has found a new legion of fans. Only some years ago, reports were leaked that W.W. wasn’t doing so well sales-wise and not capturing the fans. It had been many years since George Perez had come along and breathed new life in to the Amazon in his astounding series in the 1980’s that is still classed as a classic series. It stripped away Wonder Woman’s Americanism and brought her back to the naïve Greek woman from Paradise Island. 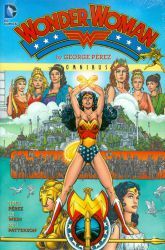 Needless to say, and with impeccable timing, the second volume of George Perez’s run on Wonder Woman is to be released in hardcover soon. You would be mad not to get yourself a copy. So, despite ‘Batman vs Superman’ upsetting a lot of fans, Wonder Woman appears to have corrected the balance. With world record sales over the first weekend, I am sure that Wonder Woman fans, old and new will be treated to a second film featuring our favourite Amazon. With Chris Pine starring as Col. Steve Trevor, this film has fired the imagination of many lovers of DC Comics. But where did it all begin? 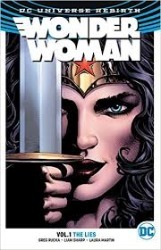 Wonder Woman was created by William Moulton Marston in 1941 – Moulton is also famous for creating the lie detector test. He was influenced by suffragettes and feminists who had or were at that time fighting for women’s rights. It was through Moulton’s support in their beliefs that he felt the world needed a woman in comics who could inspire as Emmeline Pankhurst had been an inspiration to so many. Wonder Woman and her creator are explored in Jill Lepore’s fascinating ‘biography’, The Secret History of Wonder Woman. As mentioned before, Perez’s book is out July, but even DC seems to have got Wonder Woman fever with a spate of new books. 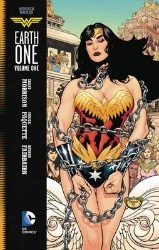 The first volume in the Wonder Woman ‘Rebirth’ series has Diana at odds with her memories. She remembers visiting Paradise Island/Themyscira, but something seems slightly skewed and she can quite put her finger on it. It all feels… fake. Has her life all been a lie? This is a new take on Diana’s life and her origins and is a great stepping on platform for new readers. Grant Morrison is one of the most innovative writers operating in comics today. His novel, Wonder Woman: Earth One gives a new perspective on Diana’s origins, portraying a princess who is frustrated with the limitations of being on Paradise Island. It also explores lesbianism, which isn’t too shocking as with only women being allowed on the island, you have to reason the Amazons are limited when it comes to releasing carnal needs and affection. Paquette’s artistry brings Paradise Island alive with its steampunk mix of Greek mythology and sci-fi tech. I foresee that everything in the coming months will be everything Wonder Woman, especially as she also appears in the upcoming Justice League movie released in November 2017. Let’s hope DC continues with the momentum started by Wonder Woman, and is a critical success as well!